You are here: Home / Documentation / FAQ / What is particulate matter composed of? The chemical composition of dust particles shows a high degree of variability and is dependent on the proximity of emission sources and on the transformations that the particles might be subject to in the atmosphere. From the CHEMKAR PM101 study, it becomes clear the 'average' chemical composition of PM10 in Flanders consists of 40% secondary inorganic ions such as nitrate, sulphate and ammonium. This secondary inorganic particulate matter is mostly caused by emissions originating from the agricultural, industrial and transportation sectors. The organic mass (dioxins, alkanes, PAC's,...), which makes up 20% of the total mass of particulate matter, is a complex group that consists of both primary and secondary matter. It is assumed that combustion processes, amongst others, play an important role in the formation of this organic fraction. 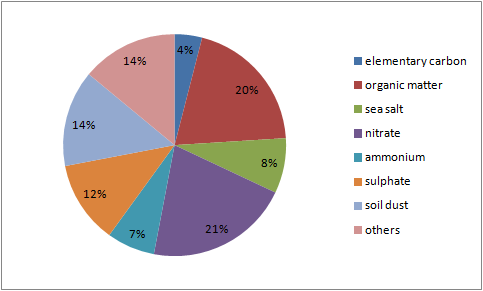 The share of soil dust (14%) originates, as the name suggests, from whirled up soil dust. This might happen through for example plowing of fields, but it may also be street dust that is resuspended by traffic. It is mostly the coarser fraction of PM10 we are talking about here. Sea salt (8%) emerges from the evaporation of flown up droplets of sea water and has a composition similar to sea water. Elementary carbon (4%) is a measure for soot released by fossil fuel and biomass burning. Presumably the most important source of this component is (diesel-based) road traffic. There are multiple clues that this fraction of particulate matter is one of the most harmful for human health. 1Source: Chemkar VMM (2009), Chemkar PM10: Chemische karakterisatie van fijn stof in Vlaanderen, 2006-2007.